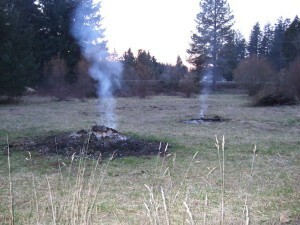 It’s been dry enough that I was able to start our fourth and fifth burn piles for the season. Four more piles are waiting for me to burn and more to be made. I am going to feel very happy when our land is completely cleaned up. Hey, where are the pictures of the mice who have scorched bums and half tails? Because I didn’t want to get THAT close to the mouse. He scared me in the first place.